You may be wondering why I haven't written a post on my blog for over a month… well, it’s because I have been lucky enough to have been abroad and very busy. July and August have flown by so quickly it’s only now I’ve been able to sit down and have the time to fill you in on my amazing yet exhausting summer I’ve had. Just over a week after the British Triathlon Championship in Liverpool I was back at the airport with a suitcase and my bike box. This trip was to last 3 weeks, 3 weeks of hard training, racing and no parents. From the 22nd of July to the 4th of August I trained with the West Midlands Triathlon Academy, we travelled to France where we stayed in Morzine. I had already been to Morzine twice before to go Skiing and to watch the Tour de France go up Avoriaz, from this I knew the trip would be all about the hard cycles and getting used to training in the warm weather. Training with the West Midlands Triathlon Academy was great, training with people of the same standard as you really helped you work hard but also have a great time. Out of the three disciplines in a triathlon I find cycling the most enjoyable and exciting, so the camp was perfect for me! After a long day of travelling, the first day was spent going up small climbs. We decided to make the rides more interesting by making our own Tour De France with us all competing for the white, yellow, polka dot and green jerseys. I decided to go for the white jersey, along with Ben, Jordan and Sian. Our Tour De France got very competitive as the days went on, which only meant we were training even harder. Avoriaz is an amazing place to go and we cycled to some amazing, some of the climbs we went up were the Col de La Ramaz, Col de Joux Plane and more! I was really pleased with the rides and climbs we’d completed and even more so that in the end I won the white jersey by 1.40 in front of Ben! We mostly ran after the bike rides, we would do an hour of steady run down by a cold river. We also did hard run sessions, the first, on a football pitch involving 8x400m which was extremely hard due to the sun beaming down on us. The second hard session was a 5x1k along the river; this was a brilliant session apart from the odd person, dog or duck we had to run round. My favorite run of the camp was a 2 hour run up a mountain I had skied down. Although when we got to the top the only way back down was to walk or run, meaning our run was a total of 3 hours long! The swimming was varied; we did some in the pool and the main sessions in open water. We had the opportunity to train with the D Squad, this was an open water session which consisted of a 2k straight WARM UP round the lake. This involved lots of swimming, I’ve never done such long sets, just when I thought it was time for a warm down we were told 2x1km efforts. This was definitely the hardest open water swim I have ever done. The camp came to an end, but it wasn’t the end of Sian, Jimmy and I. We were back to the airport and boarding our next flight to Hungary, nothing about Easy Jet is ‘easy’, but without any adults we successfully got on the right flight! We travelled to Hungary for the week to train and race in the Junior European Cup Race, this would involve the Semi Final on the Saturday and if we were to finish in the top 14 we would go through to compete in the final on the Sunday. The training during the week leading up to the race was steady and easy, and having just been in the hot weather in France we were used the boiling weather of Hungary. 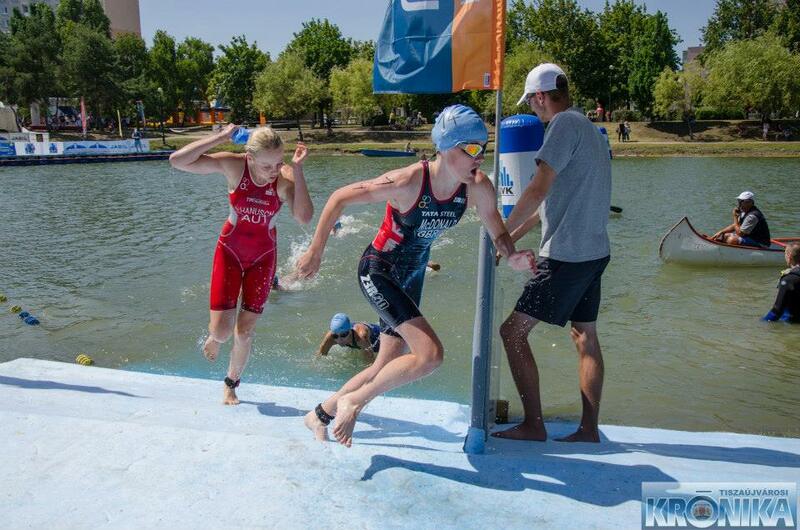 This was a European Junior race so I was competing in the junior age group which was 16-19 year olds so I would be one of the youngest competing having only turned 16 in July. Saturday soon came and the semi final took place in Tizavarouse, there had been a storm the night before so the weather was much cooler which I very happy about, I much prefers to race in the cooler weather. The race consisted of a 500m swim, 12km flat bike and a 3.2km run. My semi final race went well exiting the water in 4th place then onto the bike with a group of 5 athletes, we all worked well together. I was able to relax on the run and get into a good stride finishing in 7th place, which was an easy qualification due to there being 14 spots in my race available. I’d never done two triathlons in two days, so this was something new and exciting. Sunday was the final, I felt prepared, a bit nerves but very excited and ready to go! The course consisted of the same swim but with a different bike and run course. I had a good start on the swim but coming up to the first buoy I found myself under the water being dunked and couldn’t find my way to the surface, this put me right back on the swim but I got myself together and carried on, I’m really proud of myself for not letting it ruin my race. I exited the water 20s behind my semi final time which was not good but there was nothing I could do it about but work my hardest on the bike. The bike was hard with only me and another athlete pulling the whole group up to the 2nd chase pack. Being in the chasing position and doing all the work is hard, I was exhausted going onto the run and there were still lots of work for me to do. My run was slow, hot and very very hard, but I finished in 18th place. Although this is a lower position then I had hoped, I’d made the final and had a great experience.